Add your gelatin and 1/2 cup of the ice cold water to the bowl of a stand mixer. Let it sit while you work on the next step. In a small saucepan, combine the remaining 1/2 cup of the ice cold water, the granulated sugar, corn syrup, and salt. Cover and cook over medium high heat for 3-4 minutes. Uncover and clip a candy thermometer onto the side of the saucepan. 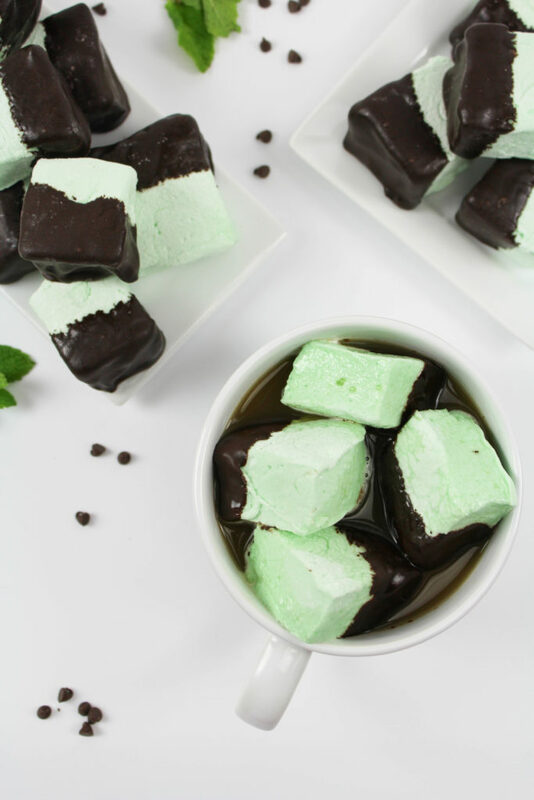 Continue to cook until the mixture reaches 240 degrees F. (This is an important step and a candy thermometer is absolutely necessary in ensuring your mixture reaches the right consistency for the mallows! Trust me on this one and don’t try to guess, or you’ll probably end up tossing batch #1 in the trash like I did). Once the mixture reaches the correct temperature, immediately remove from the heat. Next, attach a whisk attachment to your stand mixer. Turn the mixer on low speed, and while mixing your gelatin, slowly pour the sugar syrup mixture down the side of the bowl, adding it into the gelatin mixture. Once all of the syrup is added, increase the mixer speed to high. 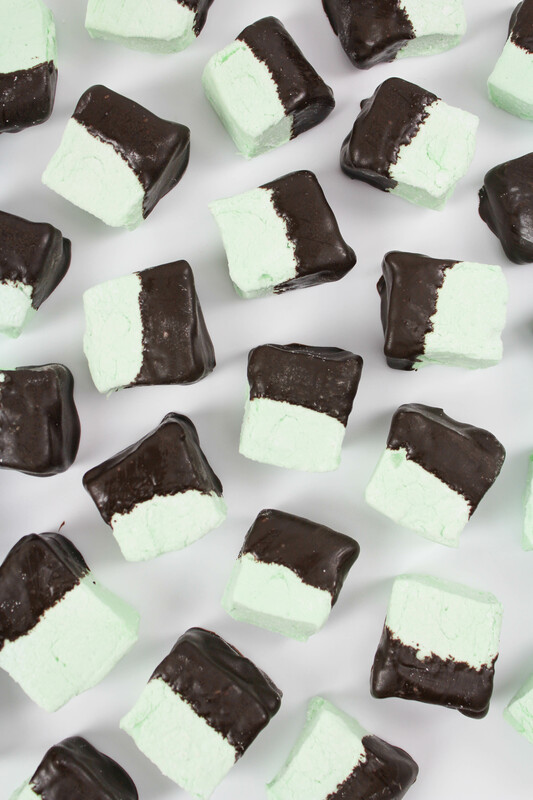 During the last 2 minutes of whipping, add green food coloring drops until you’ve achieved a minty green color that you’re happy with. During the last minute of whipping, add the peppermint flavoring. While the mixture is whipping, it’s time to prepare the pan! In a small bowl, combine the confectioners sugar and cornstarch. Set aside. Lightly spray a 13×9 inch pan with nonstick cooking spray. Add the sugar/cornstarch mixture to the pan, coating the bottom and sides. Return the unused mixture back to the small bowl to use again later. 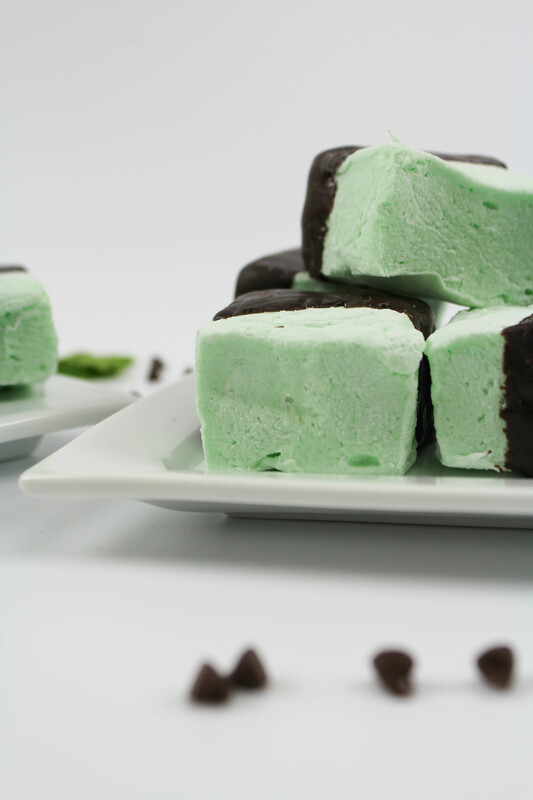 When your marshmallow mixture is done being mixed, pour the mixture into the prepared pan. Use a lightly oiled spatula to spread the mixture evenly and smooth out the top. Sprinkle the top of the marshmallow mixture with enough of the sugar/cornstarch mixture to cover evenly. (Reserve the rest for later). Let the marshmallows sit, uncovered, for at least 4 hours, and up to overnight. 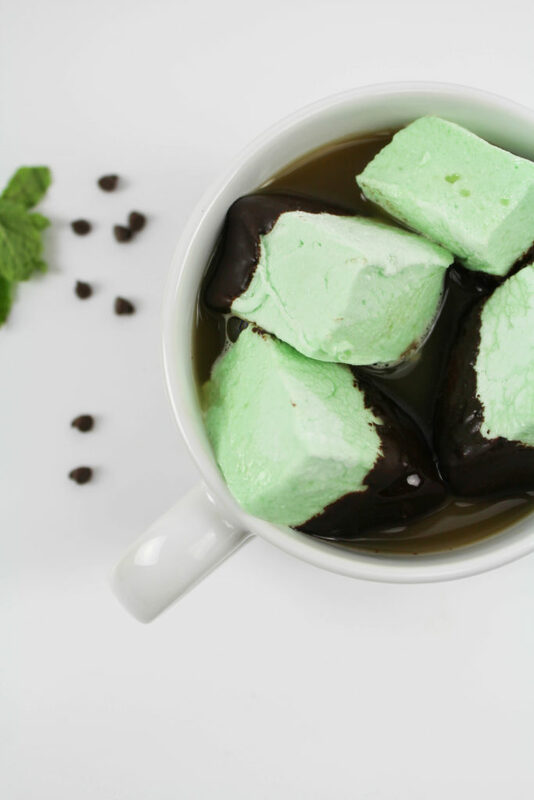 Once set, turn the marshmallows over onto a cutting board and cut them into 1-inch squares. The easiest way to do this is to use a pizza cutting wheel, dusted in that same sugar/cornstarch powder. As you cut, continue adding more powder to the wheel to prevent sticking. 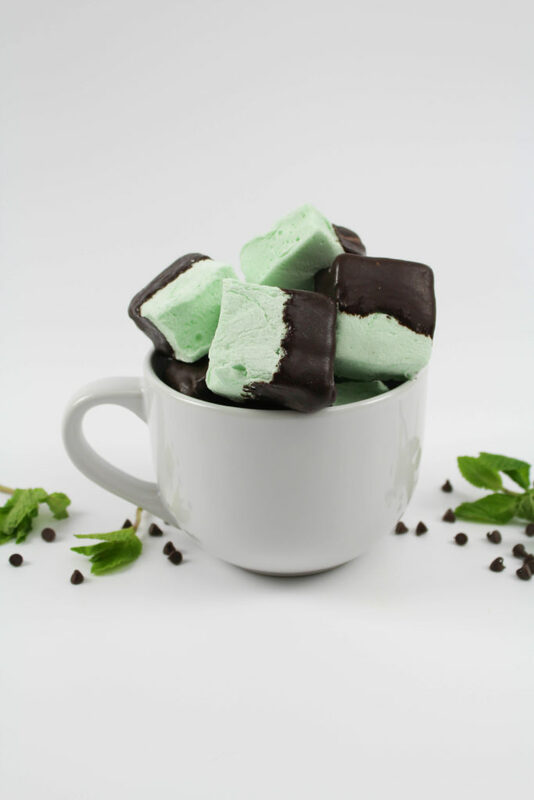 Once all of your marshmallows are cut, dust each edge with more of the sugar/cornstarch powder. 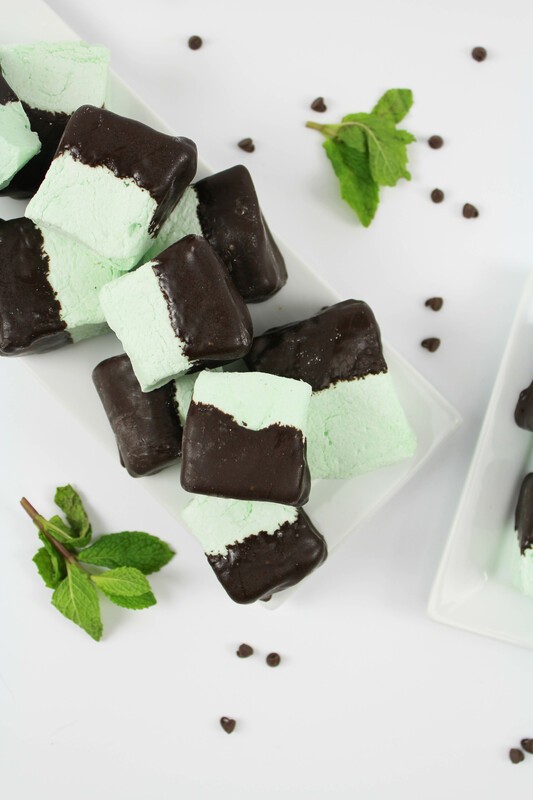 Now it’s time for these little mint chocolate marshmallows to take a dark chocolate dip! Melt your dark chocolate candy melts according to the package directions or melt your chocolate chips using the double boiler method. Once the chocolate is melted, dip one end of each of the marshmallows into the chocolate and tap off the excess. Place the dipped marshmallows on a sheet of parchment paper to dry completely.